Individual responses to the 19th C Derby Porcelain pattern books. Part of the Air Arts INNOVATE exhibition Inspired the industries of Derby, http://www.airarts.uk/ The exhibition is located on Gynaecology Outpatients Reception. Thank you to Royal Crown Derby for their kind permission to use their images. The Recovery Quilt has been created by more than 50 participants who stitched their own personal response to ‘recovery’. 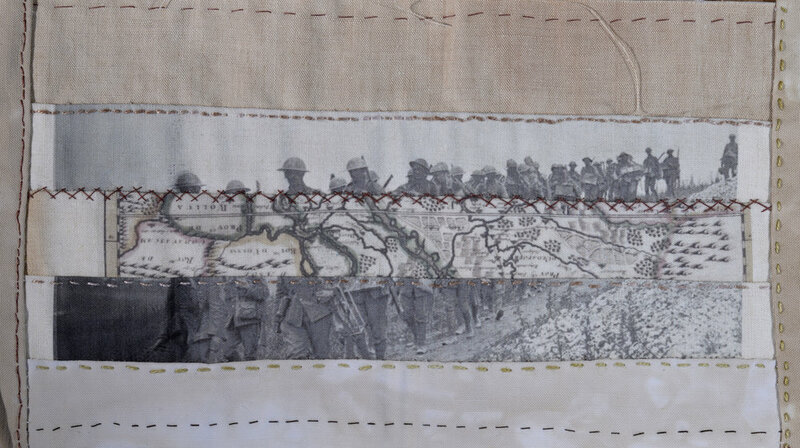 The Recovery Quilt began as a response to official war photographer Mark Neville’s Battle Against Stigma project to raise awareness about Post -Traumatic Stress Disorder - PTSD. Taking inspiration from the ‘Crimea Quilts’ made by 19th C convalescent soldiers, the quilt is made up of hand-stitched, dyed and printed textile piece using vintage linens and threads. The 'Recovery Quilt' references a history of conflict and recovery, illustrating the personal journeys and stories of the many participants. Each piece is a testament to individual's own perspective on recovery. As a whole, the quilt reflects our extraordinary capacity for recovery, and the contribution creative practice can make. The quilt is made in a traditional American style known as a ‘Jelly Roll Quilt’. It is made from a collection of strips of fabric that are 2 1/2 inches cut across the width of the fabric, then rolled into a fat roll that looks like a slice of ‘jelly roll’ - or Swiss roll as we call it in Britain! The quilt was inspired by the textile history of the Derbyshire and the diversity of the group. The embroidery is executed in a traditional ‘Colonial Knot’ stitch and reads ‘Common Threads’ in Braille. Showcasing work created with Fleet Arts through the Derwentwise ‘Anatomy of a Landscape’ project. The Common Threads: Make & Mend group worked with artist Anne Alldread to create hand felted and embellished pieces inspired by the Derbyshire landscape, geological maps and the river Derwent. Common Threads Showcase taking inspiration from the Textile heritage of the Derwent Valley. Examples of ‘slow stitching’, an exploration of the history of textiles in Belper and creative workshops which give visitors an opportunity to learn and share traditional textile skills. An installation exploring a personal history of the textile history in the Amber Valley. In an installation showcasing the work of the Common Threads: Make & Mend 2015, a variety of textiles inspired by aquatic plants and creatures, both real and imaginary were displayed in a playful ‘aquarium’. Participants learned new skills to create vibrant individual pieces through knitting, sewing and crochet. Responding to the Six Streets Arts Trail 2015 Yarn Bomb brief, the group took inspiration from aquatic plants and creatures, both real and imaginary. Participants learned new skills to create vibrant individual pieces through knitting, sewing and crochet which can be assembled in a variety of installations. Inspired by an exquisite 18th century silk apron at Pickford’s House Museum, the group worked their beautiful the design on calico using a combination of stranded cottons and cotton perlé. The small shells panels are mounted into a Cathedral Window Patchwork panel made in traditional calico. Work created through the NIACE - funded project and inspired by traditional textile techniques.